Earlier today, WikiLeaks sent a series of tweets that unsurprisingly campaigned for Julian Assange and continued it’s attacks on the Guardian. 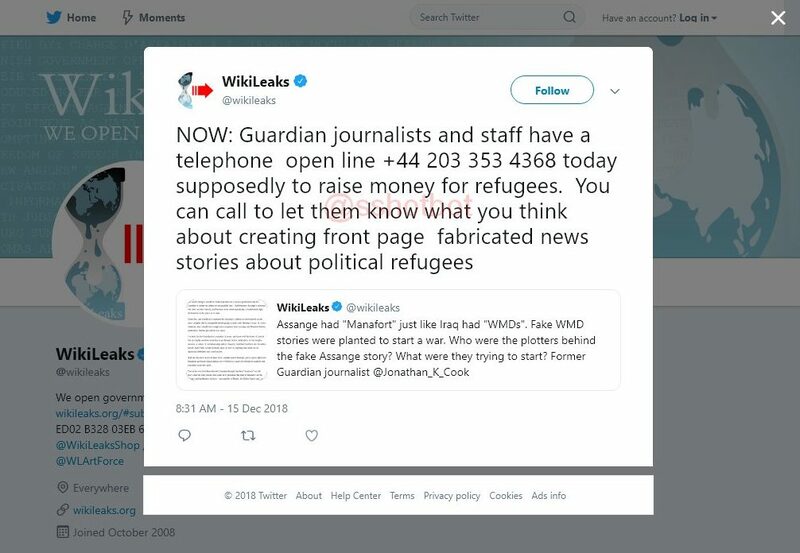 These culminated in a now deleted tweet (captured by Screenshot Bot) in which the organization posted a phone number operated by the Guardian, which it instructed its followers to call to express their displeasure about the newspaper’s coverage of Assange. The displeasure almost entirely focused on the recent, as of yet unsubstantiated, article which reported allegations that Assange had met with Paul Manafort several times. The result of WikiLeaks’ followers making these calls would have certainly communicated their displeasure, though it would have done so by disrupting the fundraising efforts for charity. The tweet quickly drew criticism from other high profile Twitter users, with some users referring to as a Distributed Denial of Service attack on a charity. As some readers noted, the Windrush generation — the beneficiaries of the fundraising drive— were not quite refugees, as WikiLeaks put it. Still quite deserving of support and increased public awareness. As of this posting, WikiLeaks has not apologized for or explained the deleted tweet.